Would you like to take part in a movement to return ART back to its rightful place in our culture? As a powerful path to nurturing, growth, connection, and transformation? As a hidden map to our inner landscape, higher knowing, and radical insights? Are you ready to integrate intuitive creativity into your life path as a personal practice or in your work as a teacher, artist, therapist, healer, spiritual leader, coach, or mentor? As a certified facilitator of Intuition Painting®, you will be able guide others through a one-of-a-kind creative process for emotional freedom, awakened creativity, empowerment, and inspiration. Master Intuition Painting® Facilitator Montine Blank, with 20 years experience has collaborated with other celebrated IP Facilitators Elise Crohn and Pamela Hawkins to design a one-of-a-kind, intensive Facilitator Training Certification Program spanning 3 phases over 10 months, with options for up to 4 immersion retreats, 12+ online sessions, practice sessions, personal mentoring and more. The entire 3 phases will cover the principles, methods, mantras, process, and meditations of Intuition Painting® as well as group or individual in-person, online facilitation skills, and business launch and marketing strategies. The program offers a resource and template database for those who want to lead workshops and events, so that you will not have to start from scratch. Whether you intend to launch or expand your business, or just want to experience deep personal transformation, you are invited to apply for the training. Space is limited to 16 participants. Experience the Methodology, Applications, & Benefits of Intuition Painting™within a group setting. Gain entrepreneurial coaching and guidance for business launch. A certified Intuition Painting™ facilitator has evolved and matured emotionally as a direct result of working through this process. The training ensures you complete ample hours in your own Intuition Painting™ process. You will learn to conquer your own fears around authentic expression with heART and compassion. You will learn how to consistently blast through creative blocks, so that the faith you have in your own wellspring of creativity strengthens your confidence when teaching others to do the same. As your belief in the process takes root, you will be more adept at staying present, while guiding others, and holding safe space. A certified Intuition Painting® facilitator has learned an exemplary means for guiding others through this intuitive creative process. Through observing and practicing group facilitation with mentors and Master Facilitators, you will master leading individuals and groups in Intuition Painting®. Upon certification, you will understand how to create and hold a sacred space while advancing participants through multiple stages of the intuitive creative process. You will be able to handle challenges that arise while balancing the energy of the whole group. You will sense how and when to intervene and offer guidance to participants in their creative process, and when to patiently let the process do it’s own work. And finally, you will come away with the skills needed to run a variety of related offerings: from introductory workshops, to online or in-person class series and retreats. A certified Intuition Painting® facilitator knows how to prepare, market, and fill classes, individual sessions, workshops, collaborations, and retreats. Do these words sound like what you say to yourself? You've been interested in facilitating art as a therapeutic outlet, but what you have found are multi-year courses that cost tens of thousands of dollars and require burdensome time commitments. You are already in a helping profession, and want to incorporate this work in order to attract clients and expand your offerings in the field of well-being. There are those of you who will want to participate in this incredible experience as a means of experiencing deeply transformative healing work for yourself. There is no requirement to facilitate after completing the training. Who Takes Intuition Painting® Facilitation Training? People from many different walks of life, professional fields and levels of art experience can benefit from and utilize the unique experiential training of the Intuition Painting® Facilitator Training. Whether you join the program primarily for professional or personal goals, your life will be transformed and enlivened by this extraordinary creative process. Adding intuitive creative modalities to your coaching tool kit can help to dramatically shift your clients from over-thinking and intellectualizing to direct contact with their soul purpose and path to reach it. Coaching through creativity is a fast-growing segment in the industry today. Intuition Painting® is effectively coaching through art. Are you a therapist or social worker? Are you searching for a way to supplement your traditional work with clients? Would you like to learn new effective and fun ways to practice self-care for yourself and your clients? 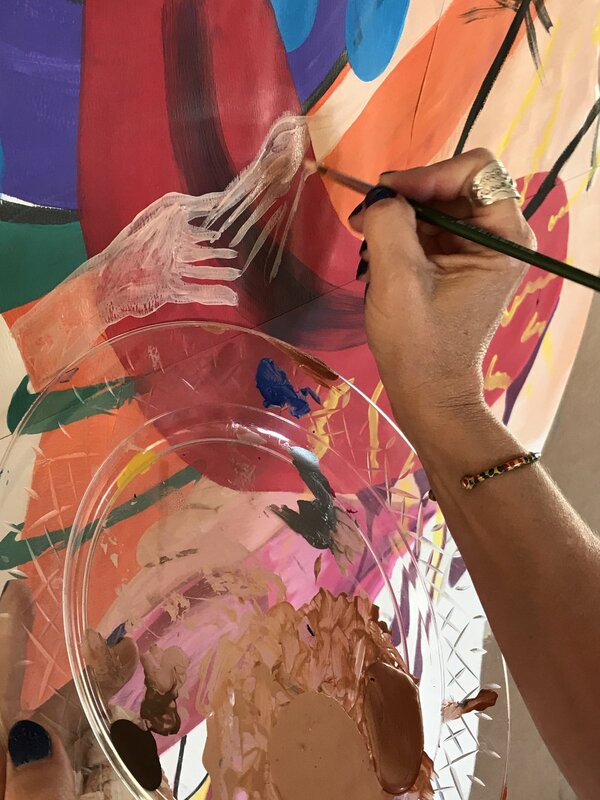 Can you imagine teaching workshops where simply painting spontaneously becomes the basis for profound personal transformation for your clients? This process can help you access deeper levels of awareness, empowerment, and transformation for both individuals and groups. Are you an artist or art educator? Many people arrive at the door of an expressive art studio as refugees from their own art education! If you are yearning for an unleashing of your creative energy and escape from any limiters that were taught in art education, this training is for you! In the Intuition Painting® training you will first recover and enhance your own joy in the creative process and then learn how to teach others in a way that does not restrict creativity to “how-to’s”, “craftsmanship” and sale-ability. Are you experiencing a life transition? Many people find transitions in life to be the perfect time to realign with their long lost muse. Intuition Painting® can be a powerful segue to a new life path and career that combines your love of creativity with your desire to help others align with their own passion and purpose. You can learn how to use the Intuition Painting® process to burn through stagnant energy, stale ideas, and “ruts” of living that are ready to be released. As your being fills with fresh creative energy and your mind opens to bright clarity you will learn all the nuts and bolts of creating a safe sacred space for your own creative work and to teach others. Are you a spiritual leader, shaman, or seeker looking for new tools for spiritual growth? Intuition Painting® training will teach you how creating art as a meditation can lead to mindfulness, self awareness, and personal transcendence. For some, this approach becomes the preferred means to manage the ego and heal wounds of the soul that otherwise cloud one's perspective on their spiritual path. Intuition Painting® can be organized and facilitated as a means of spiritual practice used by spiritual directors, clergy, and lay people for their own self care as well as for their congregations. Are you seeking intense personal development? Recovering your natural creative imagination offers a new frontier in healing and personal evolution, and some say the most rewarding journey of all. Beyond finding and fixing faults, beyond perfection, beyond becoming “better” is a vast land of authentic, genuine self expression where the true wonder of being a human being is explored and appreciated. If you are ready for this unlimited journey – this training may be right for you. The deposit is $500 and is not refundable, but is applied to tuition once you are accepted into the program. (* Not included in pricing are flights & accommodations for the onsite immersive retreats. Montine Blank: (Program Director, Lead Facilitator, & Professional Coach): An Intuition Painting® Master Facilitator with 20 years experience, founder of Paint Awake™, and Certified Transformational Coach at The More You. Elise Crohn (Training Mentor & Program Consultant): Founder of Juicy Creatives Studio and Intuition Painting® Master Facilitator with 20+ years experience. Pamela Hawkins (Training Mentor & Program Consultant): Artist and Art Medicine Woman, Pamela Hawkins is a Master Intuition Painting® facilitator, writer, and presenter.